Peter Jorgensen, Fred Nelson, and Chris Callesen, Seven Falls, South Cheyenne Canon, Colorado; digital image 2014, privately held by [personal information withheld], 2014. This souvenir photograph features three mustachioed men in sombreros posing astride burros in front of a rugged western landscape. 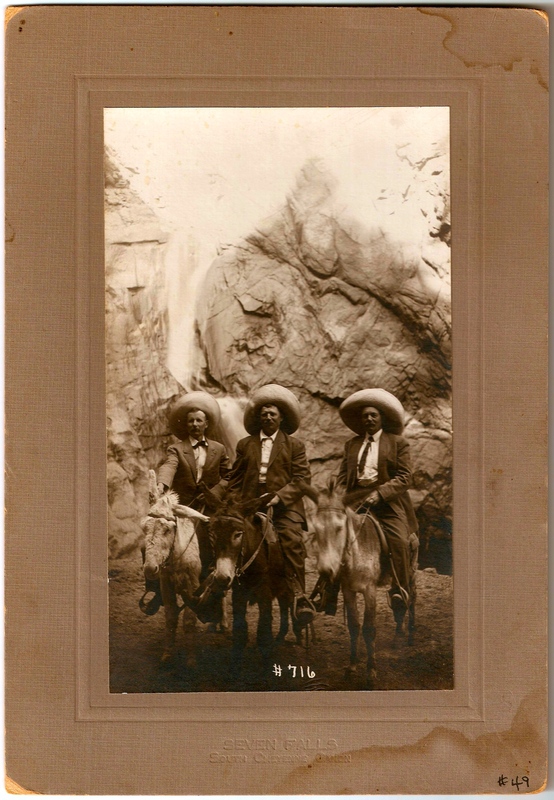 In 1911, Peter Jorgensen, Fred Nelson, and Chris Callesen of Yankton County, South Dakota, pictured here from left to right, ventured west to Seven Falls in the South Cheyenne Canon near Colorado Springs, El Paso County, Colorado. I can’t know for sure what brought them west; I do know that, decades earlier, brothers-in-law Fred and Chris had traveled at least as far as the Black Hills to sell eggs to the miners.1 It’s possible that this trip to Colorado, however, was purely an opportunity for sightseeing and adventure, rather than business. The reverse side of the photograph, mounted on heavy card stock, provides printed detail about the South Cheyenne Canon, famed for its natural beauty and sites of historical interest. The Seven Falls Photo & Curio Co. was responsible for this photograph, which was “taken at the foot of the famous Seven Falls.” It was possible to order duplicates by referencing the number shown on the photograph. (The number on the mat came only recently.) 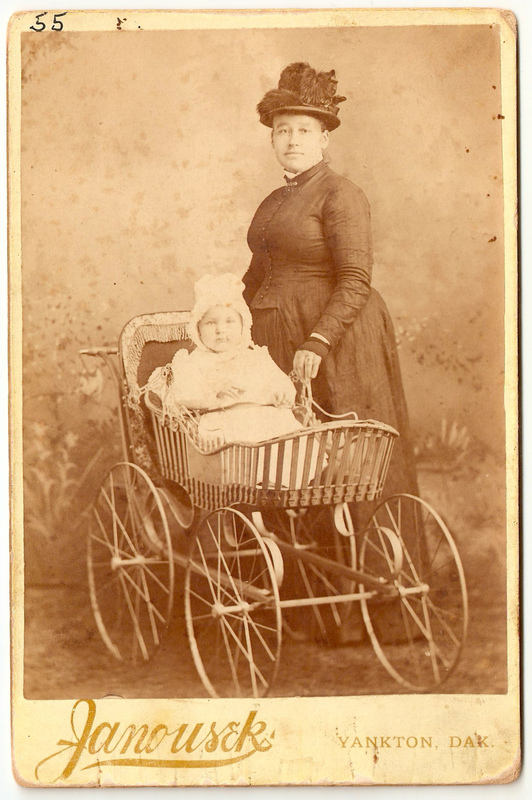 Given the number 716, it seems that plenty of these souvenir photographs must exist; I spotted several on eBay and on The Henry Ford Online Collection. Did the men ride to the Falls on the burros? As of 1911, there was, in fact, a Cheyenne Burro & Carriage Co. in operation,2 so if they weren’t part of the package when the men paid for their photograph, they may have opted to rent the burros independently to ease their exploration of the area – or just for fun. The same may go for their sombreros! 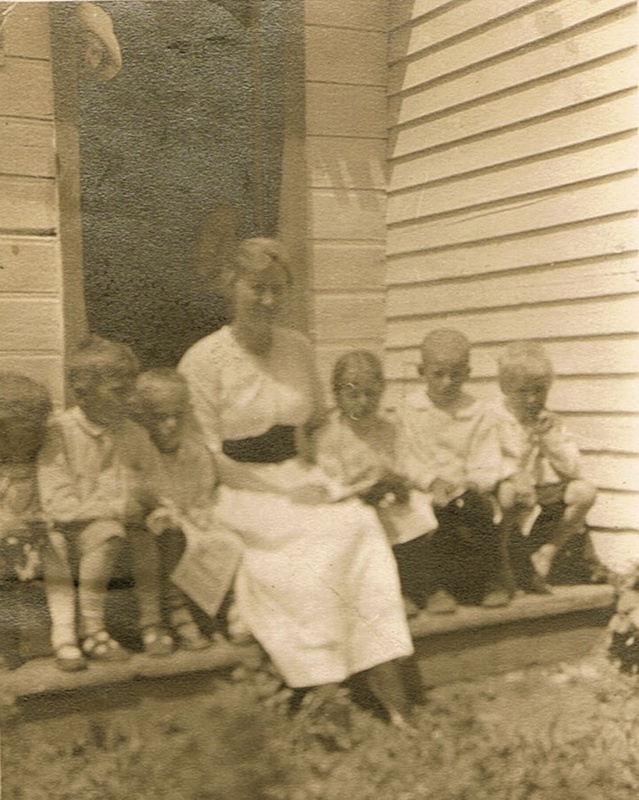 This entry was posted in Photograph Analysis and tagged 1910s, Callesen, Colorado, family history, genealogy, Jorgensen, Nelson, Nielsen, South Dakota, Yankton on March 28, 2014 by Melanie Frick. Family of Fred and Christina (Schmidt) Nelson, ca. 1915, Yankton County, South Dakota; digital image 2010, privately held by [personal information withheld], 2013. A strong family resemblance can be seen in the nine Nelson siblings. 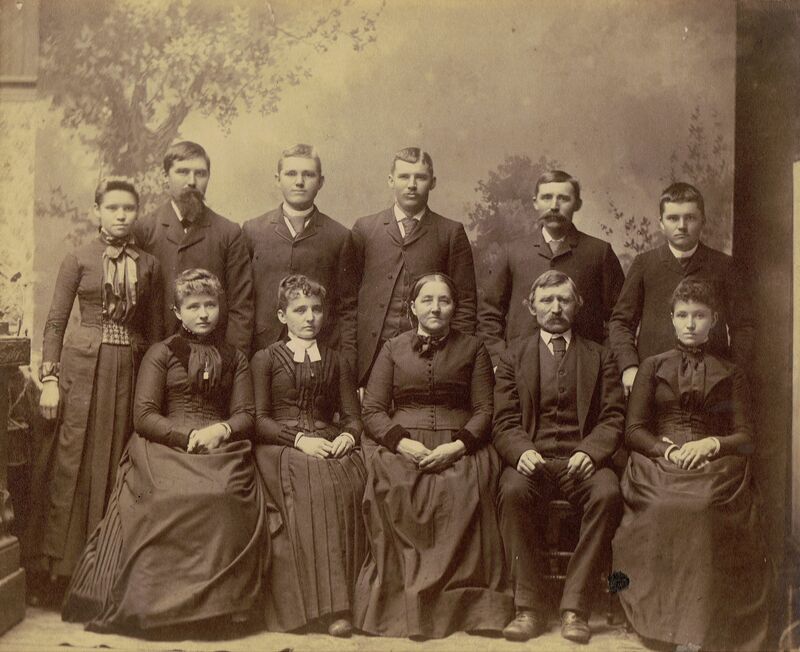 Anna and Julia stand at center; they are wearing plain buttoned blouses and skirts, as is Andrea, seated left. Louise and Helena, standing at left and right, wear almost identical dresses with wide collars, pleated bodices, and belted waists. Their dresses were almost certainly sewn by hand from the same pattern. Mary, the youngest sister, seated at right, is dressed in the most striking manner in a plaid dress with a ring of beautiful braids coiled atop her head. As the story goes, while they were growing up, the Nelson sisters would line up each morning to braid the hair of the sister standing before them.1 Someone clearly spent extra time on Mary’s hair on the morning that this photograph was taken! The brothers, regardless of age, wear sturdy wool jackets. Ole’s jacket is open over a dark shirt or sweater that seems to be in the style of a turtleneck, while young (and very blond) Fred and Myron wear their jackets buttoned over shirts and ties. They lean towards Ole, their arms propped beside his on the arms of his chair. Was there an occasion for this photograph? 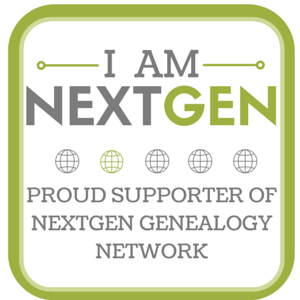 In March of 1915, Fred and Christina (Schmidt) Nelson would have celebrated their twenty-fifth wedding anniversary.6 Perhaps a photograph of their progeny was in order, either by their request or as a gift from their children. Regardless, this is the last known photograph of all of the Nelson children together, and it’s a lovely one. 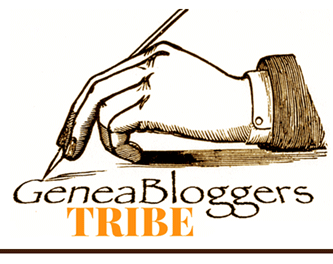 1 Phyllis (Wiese) Adam, conversations with the author, 2012; notes in author’s files. 2 1920 U.S. census, Yankton County, South Dakota, population schedule, Mission Hill, Enumeration District (ED) 251, p. 6151 (penned), sheet 1-B, dwelling 10, family 10, Anna Jorgensen; digital image, Ancestry.com (http://www.ancestry.com : accessed 4 November 2013), citing National Archives microfilm T625, roll 1726. 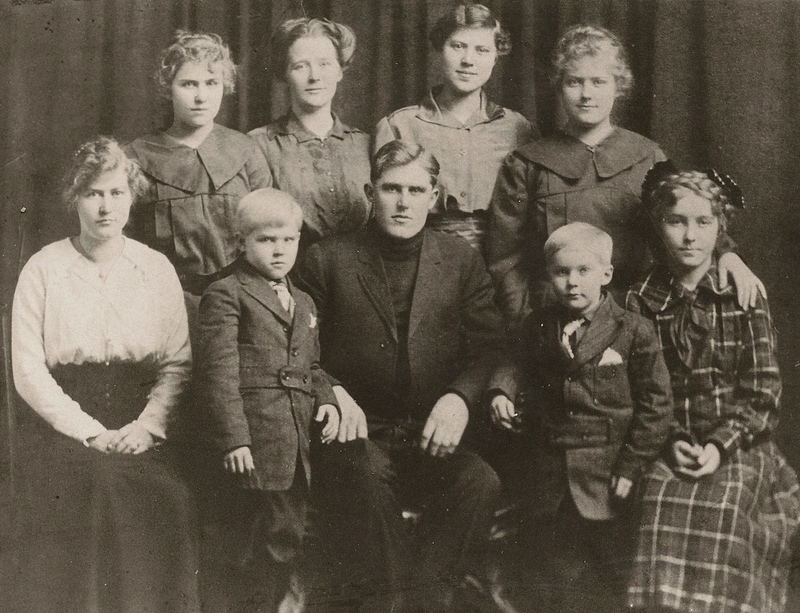 3 “South Dakota, State Census, 1915,” index and images, FamilySearch (https://familysearch.org : accessed 04 Nov 2013), Julia Nelson, Tabor, Yankton, South Dakota, United States. 4 The Echo, Vol. 1 (Springfield, South Dakota: Springfield Normal School, 1916); private collection of Brian Adam [personal information withheld]. 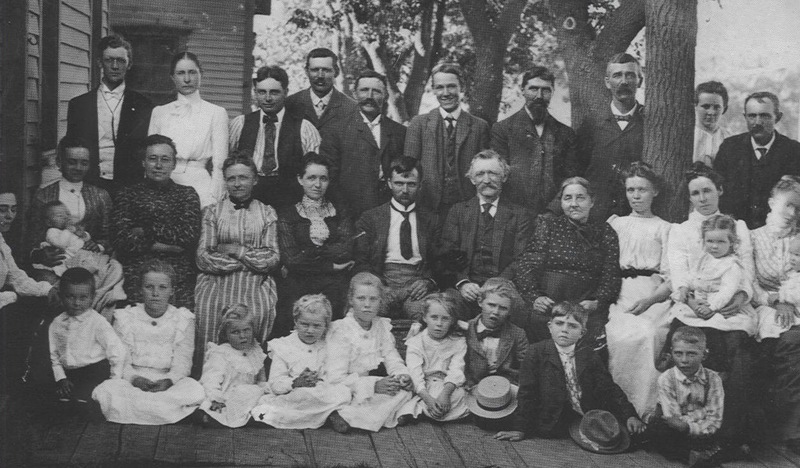 5“South Dakota, State Census, 1915,” index and images, FamilySearch (https://familysearch.org : accessed 04 Nov 2013), Ole Nelson, Tabor, Yankton, South Dakota, United States. 6“In Memoriam: Christine M. Nelson,” undated clipping, ca. January 1961, from unidentified newspaper. This entry was posted in Photograph Analysis and tagged 1910s, Nelson, Nielsen, South Dakota, Yankton on November 7, 2013 by Melanie Frick.